A Disease appearing out of living life is a “stop” sign. We could stop, watch the road in all directions and choose the one more suitable for us. Without this opportunity, we will go in automatic pilot, while daydreaming. Just like driving a car through the same roads. The “same old thing” will occur. We could perceive that same disease in many other ways. After all, it is just a matter of perspective. WHAT IS, IS. We try to make sense of it, explain it, come up with a “reason,” etc. We have been trained to “fight it” as if that was an enemy. That idea that anything that happens to us against our will or conditioning is “bad,” is so detrimental. An athlete could have a disease that may stop his “achievements.” Nevertheless, Life is not concerned with that human idea. Our bodies are not designed for “performances,” although our society has made that idea, something to live by. A “normal” person developing a disease may feel an inconvenience; something is getting in his way. Something to “win” the “fight” is needed, to get rid of the thing without further thought. Very few will look into that disease as something to learn from. Undoing what we have done in Life, may take sometime, but we will learn a valuable experience once we dive into the underlying cause of such “stop sign” in our lives. Look beyond the physical aspect. Look into the emotional aspects. We could choose to ignore the signs. We could choose to cover it as we do with many other things in Life, but sooner or later it will resurface and to undo what has been done, will take longer to heal naturally. At the end of the day, duration of the “stop sign” is in direct proportion to our awareness. Life is so full of variety even if we live in the same place for over 50 years. However, our conditioning make it so dull and tasteless, even with great entertainment. Life is a symphony made of harmony. That harmony is without explanation or methodology. When we walk away from that synchronicity, a “stop sign” will appear in our path. Health is another movement of harmony in Life. It doesn’t happen because we have a strong will or because we read a lot. It is not the product of our reasoning. Note that I am not saying “ I will be something else,” (future tense) for that is only a creation of our conditioned mind. What I will be tomorrow, will happen tomorrow. That brings acceptance and faith in our destiny. To fight in Life for what we want, may sound good to get a job or in our next speech for an office; but in the greater view of Life, it only means our inability to integrate with Life by supporting the increase of the size of our ego. That mental construct (ego) does not exist, yet we make it so real. That sounds like a mental disease. We may need to be aware of it. Do you know if you are aware? Many times we could read or hear that “spirituality” is about awakening. That is not just “spirituality.” That is conscious living. To live Life in consciousness. Have you noticed when your consciousness changed from being a toddler into a teenager? That is because there is no division between toddler and teenager. It is a continuous. The words “toddler” and “teenager” could be used to explain things intellectually, but observe that by taking those concepts to be literal, we are creating a separation which does not exist. Let me use the word “karma” now, to explain a belief. If you are suffering from a disease now, that is the consequence of your past karma. Correct? Actually the “big picture,” the “unlimited vision” is not related with seeing Life as a fearful trip where “righteousness” is all what matters. That is just a religious perspective, which is different from what Life shows. “Karma” is actually continuity. Our perception of “good, bad” is the opportunity for change. Life changes. A disease now is the opportunity to appreciate health, to be able to be in tune with it. When we appreciate the disease for giving us the chance to be in tune with health; then we are ready for change. When we reject the disease, we will suffer our experience. Because we weren’t conscious of being healthy. No. Lack of consciousness will take us into being conscious again. That is the trip, the journey. We go from one extreme to another. It is in that awareness how appreciation arises. How could we appreciate day, if we don’t know night? However, that experience could be surrounded by “man made,” “artificial stuff,” such as beliefs, dogmas, moral standards, traditions… Please remember this: Nature… Life is not bound by Human laws, beliefs or traditions. It is not bound by your belief of a rightful God, for Nature, Life, the Universe, “His” creation… is not bound by those “rightful” laws. When we are appreciation, then there will not be the experience of duality, choosing or having a preference; for we will know that everything changes at its own time. What is to be awake then? To be conscious of the process, the change. We are Life itself, not something separate. To be conscious that this change will happen whether the “I” want it to happen or not. When we are change itself, what could the “I” hang onto? Nothing. Except a belief… and that is why, as we become more awake, deep beliefs will go “naturally” away… That is the change. Your stomach hurts? That stomach is related with other bodily parts as well as with emotions/sensations. To try to separate this “reality” of oneness is to create a problem for adaptation. When there is lack of adaptation, there is a disease. That is why, when we say: “I am a soul/spirit and not a body,” that innocent phrase creates rejection of the body by placing it below other things deemed to be “good,” “holy,” etc. If we label “spirituality” as the absence of consciousness of a body, we are negating the reality of the wholeness of the experience of Life. Therefore, the question “Who am I?” is a limit for adaptation. As we define “who I am?” that which we think we “are not” becomes the “thing” to reject, negate, forget, and even pretend that it is not there. A definition narrows down the extension of our “knowing,” what is meant to be without borders. When something does not have artificially created borders, it is open for further exploration, it is open for newness. Is the “virtue” of goodness something that you value in someone? When that goodness is limited by our beliefs and philosophies; that goodness is no longer goodness but just a “picture” instead of the “real” thing. Paradoxically, our concepts, our “knowledge” become a limitation to adapt to the changes in Life. Decaying rather than evolving; while believing in the virtue of being true to a static belief. The old paradigm of dual moral teachings based on the acceptance of what is considered to be “good” over that which is considered to be “bad,” is no longer what is required for our consciousness to expand. Because that paradigm brings guilt and fear, which in turn will not allow us to adapt to Life’s changes. It is not that guilt and fear are “bad,” but they have timing. Those emotions could be a protection for sometime, to avoid acting in a certain way; but as Life changes and our consciousness do not, that guilt and fear become the ingredients for our own auto destruction. As our consciousness grows, a different perception will arrive. It is called integration. That definition becomes the door for misunderstanding. Let me rephrase it: “There is nothing bad, because there is nothing good.” Everything is and by being what it is, there are only consequences, which will change according to time. There is nothing static in Life, but our concepts, ideals, standards and the way our minds understand the world. In that dissonance, it is difficult to flow with Life when all we are looking for is for Life to adapt to our needs and wants. In a sentence, it is the drop of water wanting to control the Ocean. Isn’t that ironic? If not plain stupid? Raymond was finally home after a busy day of work. Raymond was able to listen attentively that song for the first time! Even though, he has listened to it many times before, his mind was busy in trips back to the office, or in thinking about someone’s life, the purpose of life, etc. Raymond was looking at the window but he wasn’t interpreting anything in his mind. There was no script playing. Raymond was thoughtless! That was awareness and appreciation at the same time! Why is it so difficult to stop thinking? Let us not bring explanations and theories about it. Let us not bring a belief. Just observe the inner voice, the movie, the coming and going to different places through the mind, catch-all of that “activity” right now. Be aware of it. Conscious. And then, the miracle may happen… It may stop. If we take our attention into something else, the inner activity with thoughts and ideas will start again. Unless we are conscious of this thing happening, there is no book or religion or savior that could liberate us from living life in our heads. Thinking is “good,” only when necessary. 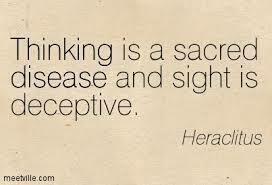 In our society, at this time; thinking has transformed into “over-thinking” which is a disease. Do you want to worry about something? Do you want to plan things out to the last detail? What about thinking about the unforeseen circumstances? Let us plan for some remedies. Let us make a scenario to think about…. Do we want tips on how not to over think? Have you heard the “it is impossible not to think” theory? That belief is an obstacle in our own discovery. To meditate, our minds need to be clear from that noise, then that silence is healing, it is comforting, it is fulfilling. Raymond experienced a meditative state while listening to that song. Raymond discovered that there was no difference between life and how a song plays. Everything starts in silence and goes back to silence. Thus, it is in silence (thoughtless state) how we could know our essence without beliefs. Question: The ability to be detached from the body is a wonderful thing Especially when you are sick and in pain physically. The question is, does the detachment from thoughts lead to detachment physically? Or use the thoughts as pointers to go into that state? There are different levels of “detachment.” Athletes can feel pain and go over it to finish a race. Obviously,there is no thought of “pain” at that time, but once they finish the race, their bodies will pay the price of not stopping “in time.” Pain is a warning. When pain is unbearable, we will lose consciousness. In between, our thoughts will be enhanced as pain increases. If we could stop thoughts on that, we will be like that athlete. That is sort of like my experience. Detachment from thoughts, or being “thought-less” is a state of higher awareness, as long as there is the perception of the “true” self, the being, the self, the soul. In that state there is “absorption,” that is; there is no longer “you.” If this state could be maintained strongly, “I” am guessing that it is possible not to feel physical pain; but that is not my experience yet.